The Shri Gurudeva Vidya Peeta was founded by His Holiness Odiyooru Shri on 11 June, 2001 with a noble mission in order to provide a value-based education to children. In a building near the entrance of Shri Samsthanam, an 8th grade class, having 26 students, of Shri Gurudeva Kannada Medium High School began. The Holy seer appointed an experienced and able person named Shri Krishna Bhat as the head master of high school. And an elder and retired head master, Shri Janardhana Shetty became a counsellor and office executive. In addition, five eligible co-teachers were appointed to aid them. Thus, a dream of the Holy Seer was fulfilled in a remote, bordering village called Odiyooru. In 2002 August, Shri Gurudeva Vidya Peeta was shifted to its own newly furnished building. 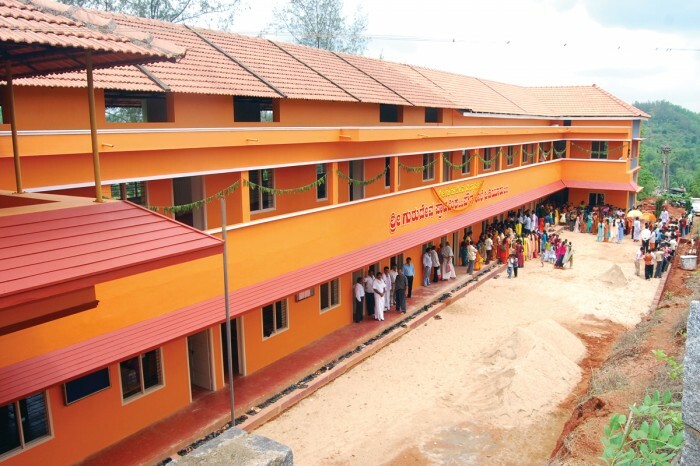 In 2004 April, the first batch of this institution attended the SSLC Exam and out of 26 students, 25 were passed. This achievement put a stellar foundation for the bright future of this institution. Later in June 2006, Shri Gurudeva Gurukula (pre-primary) and Shri Gurudeva Kannada Medium Junior Primary School were begun simultaneously. As per the desire of students and their parents, Shri Gurudeva English Medium Higher Primary School with 6th grade class was started in June 2011. The first batch of 10th grade English medium students has been preparing for the 2017 SSLC Exam. At present, more than 320 students are studying in the institutions governed by Shri Gurudeva Vidya Peeta. Shri Gurudeva Vidya Peeta has provided required infrastructure to all these schools. One can see spacious class rooms with ample light and air, well-organized library, vast playground, pure drinking water facility, separate rest rooms for boys and girls, sophisticated science labs and computer labs, prayer hall, textbooks and uniform for the students, and separate rooms for teachers and staffs provided by the institution. In addition, free nutritious lunch is provided to the students and teachers. However, this institution does not receive grant in any form from the government. The institution itself has been taking care of the expenditure. The performance of the students of this institution in SSLC Exam since 2004 is laudable. It is amazing to know that this institution has recorded 100% pass result for four times and never slipped below 93.5% in result. In addition, above 70% of students has been successful in scoring high marks. In extracurricular activities too, the students have given spectacular performance, as a result of the training provided by the team of school teachers. ‘Sharadrutu Samskara Shibira’, a free training camp arranged in Shri Samsthanam for the students in every winter has been helping them in building a personality which helps in nation building as well as overall personal improvement. In the camp, renowned persons in different fields are invited and they share good thoughts with the students and inspire them to perform noble acts for society and nation. Shri Gurudeva Vidya Peeta not only focuses on implementing Sanatana Culture in its education but it has successfully synchronized that culture with modern science inventions. As a result, it conducts audio visual incorporated satellite-based smart classes separately. There is a transportation facility from the institution for the students attending these classes. The perfect blend of senior, experienced teachers and young, enthusiast teachers is one of the driving forces of the institution. It is a notable thing that even the students from the border regions of Kerala State also come to this institution. Here, Samskrita (Language of Gods) is a part of the educational curriculum. Every day, the classes begin with the recitals of Bhagavadgita, bhajans, school prayer, state anthem and national anthem. In addition, there are classes in which sermon is given by the Revered Shri Matanandamayi. The students participate in them with zeal. In Shri Gurudeva Vidya Peeta, as per His Holiness’s will, the mission of preparing the invaluable citizens, required to build a strong nation has been going on by providing a value-based education composed of moral, life and curricular. Odiyooru Shri Gurudeva ITI (Pvt.) was started in February 12, 2012 in Kanyana under Shri Gurudeva Public Charitable Trust, with the purpose of providing well-equipped technical training to the residents of Kanyana and surrounding villages. 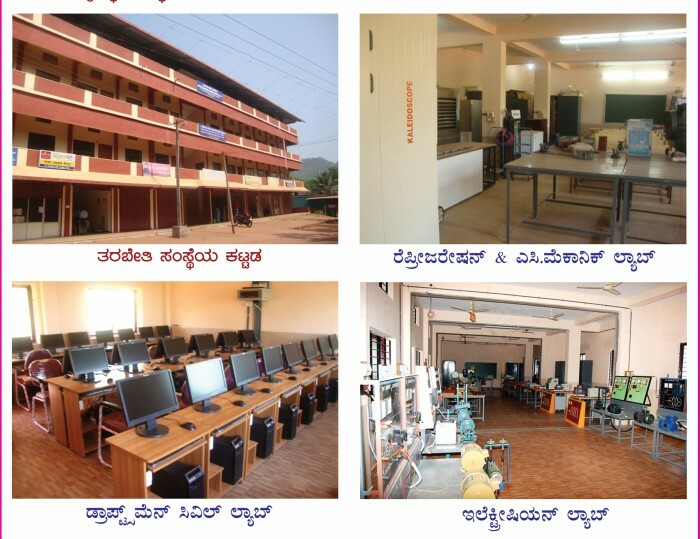 The then chief minister of Karnataka State, Shri D. V. Sadananda Gowda inaugurated this institution. In this institution, 2-year of career training is offered in Civil Draftsman, Electrician and Mechanics, Refrigeration and Air-conditioning disciplines. The institution has the accreditation of National Council for Vocational Training (NCVT), New Delhi. Labs equipped with sophisticated equipment, library, experienced instructors and well-equipped building are the features of this institute. The students are also trained in computer and English Language. Since this institute has made an agreement with reputed national and international industrial organizations, jobs are 100% guaranteed.